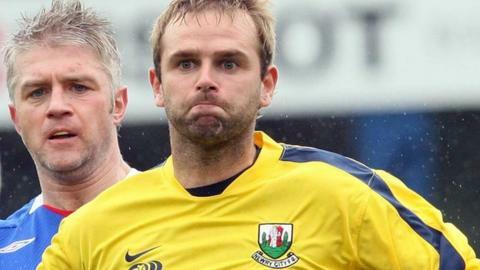 Former Rangers and Linfield striker Lee Feeney has joined cousin Warren as assistant manager at Ards. The ex-Northern Ireland Under-21 international was at the new boss's first training session on Tuesday night. Lee, who had two spells as an Ards player, was recently manager of junior side Banbridge Rangers. He will join former Ards defender David Elebert and Johnny Clapham on the first-team coaching staff. "I'm delighted to have Lee on board with me - his knowledge of the game is excellent," said Warren, who was appointed Ards manager this week after Colin Nixon's sacking. "We only have nine games to play and I was keen to have a coach that I knew well working with me. His experience will be a big asset." Lee started his playing career at Ards before a series of impressive performances for Linfield earned him a move to Rangers in December 1998. He returned to Linfield three seasons later and also played for Glenavon and Newry Town, as well as having a spell at Sligo Rovers in the League of Ireland.